Lately, all of the biggest blockbusters seem to be released in 3-D, but is this really a new invention or a fad from the past? Hollywood Myths reveals the past behind 3-D movies and how they may not be as new as you think. Teenagers watching the latest superhero movie may think that 3-D is an exciting new invention, created to let them watch Green Lanterns and Autobots soar through the air. Their grandparents, on the other hand, may think it’s a resurrected fad from the 1950s. But 3-D imagery is actually older than the movies. In the nineteenth century, a device called a stereoscope was a common household amusement. It was a slide viewer with two eyeholes, through which two side-by-side images of a cityscape or natural wonder could be seen. The images merged to create an illusion of three dimensions, in a manner similar to the one still used in Viewmaster toys. In 1915, Edwin S. Porter, who directed the pioneering movie The Great Train Robbery (1903), demonstrated a 3-D projection system at a theater in New York City, using two synchronized projectors that displayed color- coded images. The color-coding system, called anaglyph 3-D, was refined in the 1920s and 1930s in a handful of feature films, newsreels, and even Nazi propaganda films. But it was hard to keep the projectors perfectly synchronized, and the 3-D effect was limited. In the 1930s, inventor Edwin S. Land of the Polaroid Corporation improved the effect by developing better polarizing filters. The outcome was demonstrated in photography exhibits and in a Chrysler ad at the 1939 New York World’s Fair, but World War II delayed the technology’s imple- mentation in feature films. Three-dimensional films finally broke out in the early 1950s. Hollywood needed novelties to compete with television, and over the course of the decade it experimented with wide-screen formats such as Cinerama and even olfactory gimmicks like Smell-O-Vision, an air-pump system devel- oped by producer Mike Todd Jr. and his stepmother, Elizabeth Taylor. But it was 3-D that had the most immediate impact, starting with the surprise hit Bwana Devil (1952). A year later, House of Wax, starring Vincent Price, became the most successful 3-D movie yet released. The scene of a carnival barker whacking a paddle ball in the direction of the audience represented the hook that Hollywood needed. Although 3-D technology was embraced by prestige directors such as Alfred Hitchcock (in 1954’s Dial M for Murder) and used in mainstream crowd-pleasers such as the musical Kiss Me, Kate (1953), it was most common in genre films, including Creature from the Black Lagoon (1954) and a surprising number of Westerns. 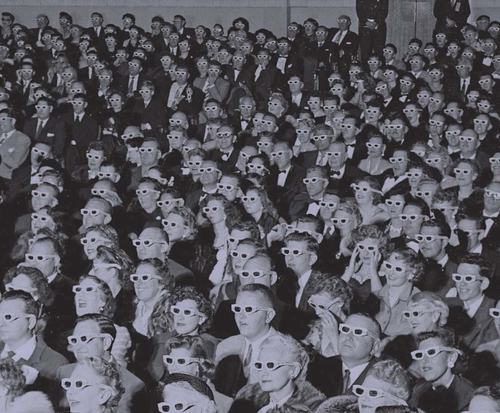 The image in Life magazine of a movie audience gawking through cardboard glasses was as quintessentially 1950s as hula hoops and poodle skirts. By 1954 the inherent limitations of synchronized projectors had effectively ended the golden age of 3-D.
After the development of a single-projector process, the tech- nology experienced a brief revival among the sensation-cravers of the Woodstock generation. In 1969, the low-budget 3-D skin flick The Stewardesses earned $27 million, the equivalent of more than $140 mil- lion today. Five years later, the potentate of pop art lent his name to Andy Warhol’s Frankenstein, a 3-D midnight movie that was noteworthy for the forward-thrusting image of an impaled liver. Mainstream Hollywood re-embraced the technology for sequels such as Friday the 13th Part III (1982), Amityville 3-D (1983), and Jaws 3-D (1983). In the new millennium, with larger and cheaper home theaters offer- ing a viable alternative to the multiplex, theater owners have sought new inducements to get consumers to pay for movie tickets (and gas and pop- corn and maybe a babysitter). The promise of a second Star Wars trilogy in the first decade of the 2000s convinced some exhibitors to switch to digi- tal projectors. Then the announcement of the 3-D Avatar, from Titanic hit-maker James Cameron, convinced many to add the converters and sil- ver screens necessary to show digital 3-D films. In 2008, the 3-D Hannah Montana & Miley Cyrus: Best of Both Worlds Concert paid off handsomely for early investors, and in 2009, Cameron’s record-shattering Avatar sealed the deal for the stragglers, who shelled out as much as $100,000 per audi- torium to convert their theaters. Though the autobots sequel Transformers: Dark of the Moon, which was filmed in 3-D by design, temporarily reversed the trend, it cost $200 mil- lion to produce, a price that few directors could afford. For theater owners who need a new gimmick, maybe it’s time for Smell-O-Vision 2.0. Hollywood exists to create and sell myth. Often, however, the myths created on screen are secondary to the rumors, half-truths, and lies that circulate through studio back lots and the press. 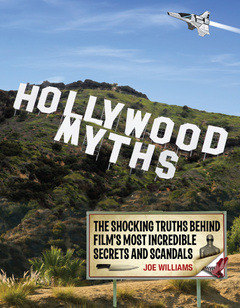 Discover the real stories behind Hollywood’s greatest myths, as veteran film critic and Hollywood reporter Joe Williams sorts fact from fiction and examines how these tales came to be and how they persisted. Did Thomas Edison really invent the motion picture? Why has Charlie Chaplin survived as the undisputed king of the silent era? What about Fatty Arbuckle and that ill-fated boys’ weekend in San Francisco? Did Woody Allen really marry his adopted daughter? Was there actually a suicide on the set of The Wizard of Oz (or are any of the other countless rumors about that film true)? The tales featured in Hollywood Myths involve specific films, actors’ private lives, the industry itself, and urban legends that have existed as long as Hollywood has. Throughout, Williams illuminates what it was that made the biggest stars—from Marlon to Marilyn, Bogie to Brad—shine so brightly on the silver screen. In all, 56 enduring myths are examined, in the process revealing the machinations of myth-making in the fast, loose, and out-of-control world of Hollywood.